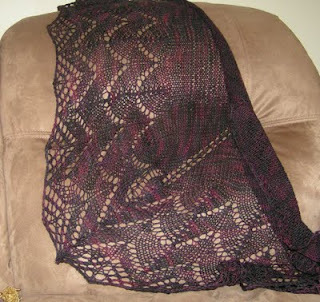 I've been knitting shawls! Not big huge ones, the small shoulder shawl/shawlette/triangle scarf shawls that are everywhere on ravelry and are so cute and easy. I just finished a fourth one that for some reason wasn't as much fun as I thought it would be - when it's blocked I'll post a pic of it, too. The top picture is the Travelling Woman shawl. It knits up so fast. I used some Socks That Rock in Lenore and love how it turned out. I've worn it alot - not with the point in front though. I need to get used to that look. The second one is a skein that Jenny dyed called Gothelberry Pink. I named the shawl Lucrezia because it kind of reminds me of something Lucrezia Borgia would wear while poisoning her next victim. 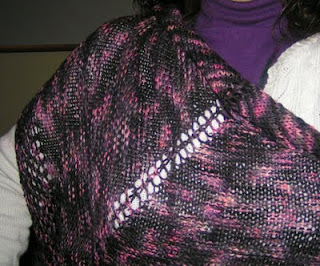 I love how the colorway knit up with just bits of pink and blurs of purple where the dyes ran together. She needs to dye some more so y'all can make some shawls with it! The third one is inspired by Theodore roosevelt for DADA last month. I dyed the yarn blue to represent how he loved being outside. The pattern is called Forest Canopy - he found out that he'd become president while hiking in the woods. I haven't worn it yet but Khloe has - she wrapped up in it a couple of times when she got chilled watching Teen Nick or Disney Channel. I've printed out patterns for about ten more of these little shawls. I can't resist them right now, and I have plenty of sock yarns to work with. Of course, I should be working on gifts right now - some of the assignments in both the House Cup and the Battlestar Galactica groups fit well with what I have planned for people - but you all know that I tend towards selfishness sometimes - especially when I've been dealing with a sick child. I can only handle so much Zack and Cody before I want to scream, eat candy, and be a brat. I'm sure you know what I mean. I've been up late lately blogging in my head - then can't exactly remember everything I wanted to say. Jenny suggested that I talk into my voice recorder and then type it out. It would be handy to be able to plug the recorder into the computer and just have all of the words appear and then I could just add pictures and edit. I don't see that happening in my near future, though, so I'll have to get used to the sound of my voice - after I get used to saying it all out loud and hoping that the family doesn't think I've lost it! I've been thinking alot about music lately. Yes, I listen to songs on my ipod - it's not all spoken content. I love listening to my favorite songs and feeling the notes and instruments flow with and around each other. I dug out a box of old cassettes the other day. I used to listen to them at work - when I had my own office and could listen to music. I surprised myself by remembering the words - all I ever wanted, everything I've waited for, build my world around you... I met the man who sang it once and he told me that he'd written it for a very special person. I'm blanking out on his name but I was surprised at how small he was - pictures of him always seemed so big, but maybe it was just the hair (late 80's, you know). I pulled out another tape that my brother had made for me - beautiful stuff that should've gotten more popular than it did - if wishes were horses, then dreamers would ride, baby. I need to get some itunes cards and make up some playlists. My tapes will be gone before long. I need to check out some new stuff, too. Maybe some of you could suggest things - or send a cd?? - that I may like. I suppose for now I'll listen to Stevie sing to the poet in her heart and let Debbie tell me that my hair is beautiful - and agree with Joey that I wanna be sedated! He he!